I love the smell of fresh bread baking. I mean, who wouldn't? People who know me know that I love baking. But they probably haven't seen me baking loaves of bread a lot. For some reason, I don't. I guess all that kneading and the process. Even though my beloved stand mixer does everything for me. But there's one kind of bread I bake time to time. And this makes Sunday mornings so pleasant. As my tot doesn't care whether it's weekend or not, he would wake up before 7am, I would just go downstairs, prep the oven and the dough I whipped up the day before - literally just simply whipped up. Then back upstairs and have a family cuddle time. Well..I have to go back downstairs to put the dough in the oven but that part is easy as at that point, I would already look forward to getting up to the delicious smell of bread. Such great feeling. 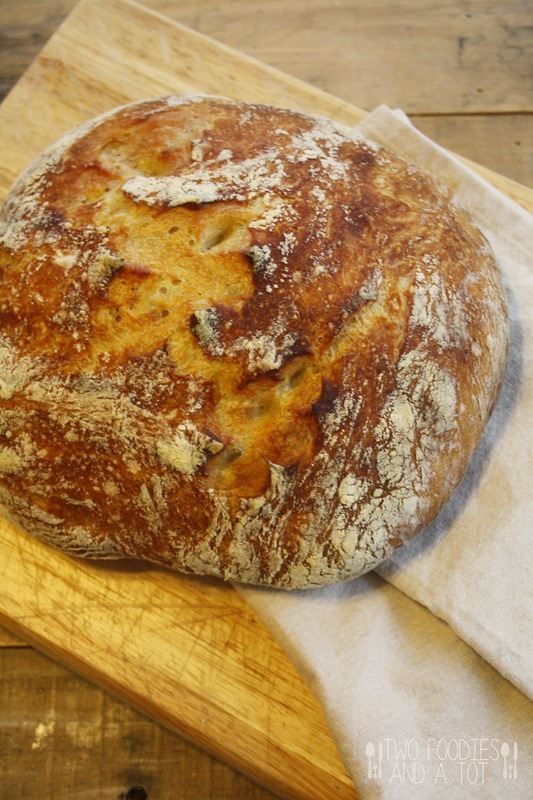 Especially when it gets colder, the walk to the oven with fresh smell of bread makes it feel so cozy. My niece and nephew slept over last weekend. They're like normal kids who are somewhat picky. And they devoured the freshly baked bread. I served it with some homemade cranberry apple jam and apple cinnamon jam along with some savory items. They said uncle Steven's house always has the best breakfast. They're the sweetest. This is so easy to make, don't even need a stand mixer or anything. Ingredients, a large bowl and a wooden spoon would do. Love how it turns out nice every time. - Even with my crazy oven which is acting up just in time for the holiday! 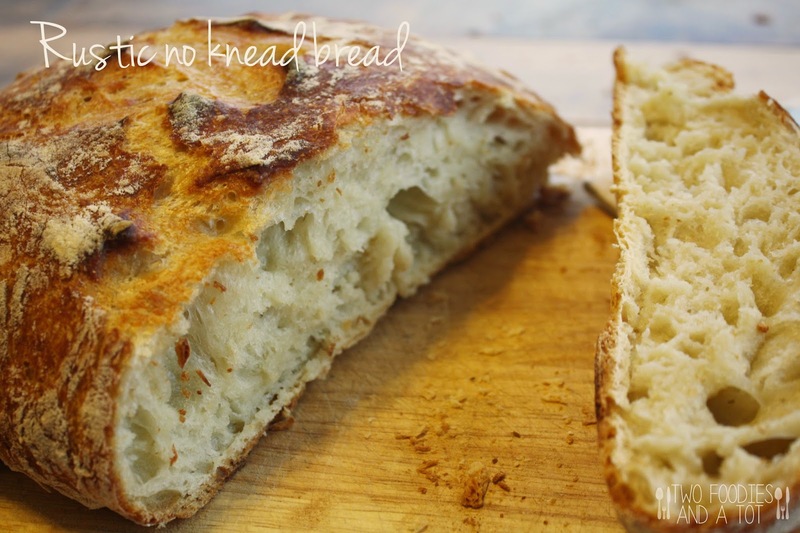 Try this foolproof recipe and you will have a successful loaf that is absolutely crusty & delicious. 1. 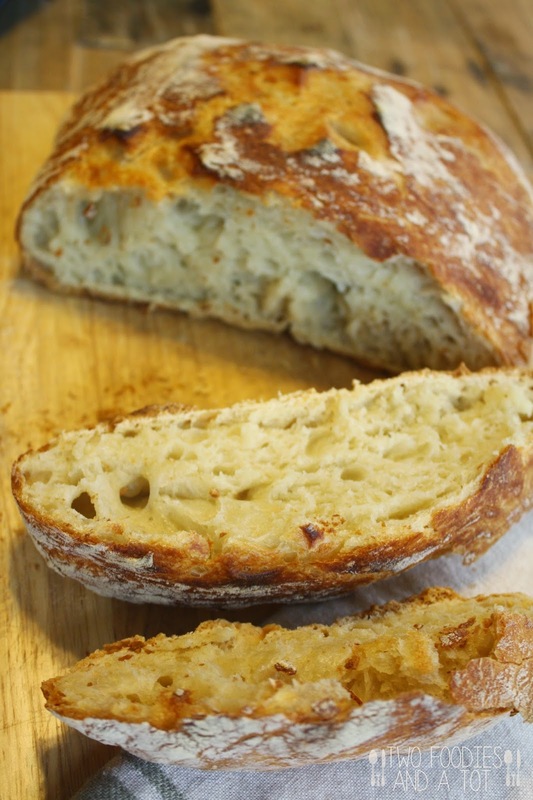 Mix flour, yeast and salt in a large mixing bowl and add lukewarm water. Stir until completely combined. Dough will look messy. 3. When ready to bake, put the dutch oven in the oven and preheat the oven to 450F. Let the dutch oven sit there for 20-30 minutes to get heated. 4. Meanwhile, put the dough on a heavily floured surface. Shape into a ball and sprinkle some flour on top and cover with plastic wrap, let it rest while dutch oven's heating up. 5. Place the dough in dutch oven -I don't know if it makes a difference but I cut a few slits with kitchen scissors- and cover the lid. Bake it in the oven for 30 minutes. Then remove the lid and bake for another 15 minutes. You will see nice golden beauty sitting in your dutch oven. * My dutch oven has enamel coating and it didn't stick at all but if yours don't, lining the bottom with parchment paper may be a good idea. *Recipe from Chef in training.